It is surprisingly tricky to find recordings. The Ordinaries at least are at Corpus Christi Watershed. 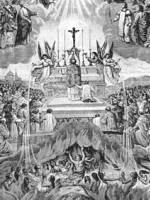 Look for Mass XVIII (18) Deus Genitor alme with Kyrie B and Agnus Dei B. NOTE: The ordinaries are the most important thing to learn. They are for everyone to learn. So get those three first: Kyrie, Sanctus, Agnus Dei. The Propers are another kettle of fish. The wonderful collection from St Benedict’s, Sao Paolo only has the Introit and Offertory. The Dies Irae (Sequence) can be found in the Internet Archive (see track 2 - the first track listed). I recorded my own take on the Gradual and Tract (Requiem and Absolve): GradualTract. The recording of Lux Aeterna is more elusive this morning. Youtube clips are musch easier to find. Here is a playlist of propers for a Requiem. Youtube frowns upon people turning these into mp3s. The other way is to buy recordings like this: DEFUNTS (LES) - Messe de Requiem, Liturgie des Saints (Choeur des Moines de l’Abbaye Saint-Pierre de Solesmes, Claire) or a cheaper one with a ladies choir: Ego sum Resurrectio: Gregorian Chant for the Dead. So, in conclusion, it looks like there’s a real gap in the market for a set of free recordings of the propers for the Mass for the Dead. And I haven’t looked at the psalm toned versions yet, but that’s a possibility too. I guess it makes sense to shorten the Gradual and Tract when you consider the Dies Irae right afterwards.